Last night at the 2014 Billboard Music Awards at the MGM Grande in Las Vegas, Nevada, the biggest buzz was generated by the hologram of the late Michael Jackson which performed along with live and hologram dancers during the award show. We however were fixated on the red carpet and all of the wow and buzz-worthy gowns, dresses and outfits worn by our Bellyitch Bumpwatch alums and others. J.Lo, Max and Emme’s mom, was giving life in this crimson Donna Karan belted dress. We were equally wowed by Nicki Minaj‘s elegant Alexander McQueen dress which revealed a hint of underboobage and cut outs in the bodice. We are also wondering what happened to her ample hips and bottom. But the wavy 40s style black hair with the gold cuffs make this look a total winner! If you’ve got the body and small waistline to pull it off why not go with this low cut black cropped top and black floor length skirt with large slit that newly married Kelly Rowland wore, accented with gold bangles and killer dangling earrings. Iggy Azalea cleans up well in a red Zuhair Murad pre-Fall 2014 gown. Can’t say the same for what’s coming out of her mouth though. Oh did we say that out loud? Our 2011-2012 Bellyitch Bumpwatch alum Shakira worked the heck out of her blue Julien Macdonald Fall 2014 mid-length dress with sheer side while posing with her partner Spanish soccer player Gerard Pique. This is an interesting look for Carrie Underwood in Oriett Domenech and certainly a brave choice. Love the color but not the cut neither the hair. Awww we see a mom-to-be! 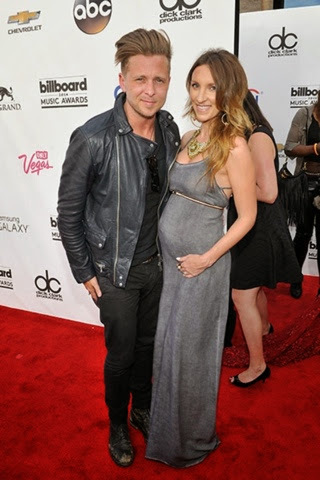 The tiny bump on Genevieve Tedder the wife of One Republic‘s Ryan Tedder was tres cute and looked well in her grey slim dress belted Empire waist style above the belly. She could’ve ditched the super heavy necklace. Dad looked like he was about to go out for a ride on his Harley not go into an award show, but whatevs. It’s not about the dudes. Speaking of Shania Twain. This is a nice conservative and age-appropriate look yet boring in basic black Roberto Cavalli, but it works for her even though it lacks wow power. No. That is all for Natasha Bedingfield in this not sure how to describe it. After recently coming out from a treatment facility for an eating disorder, Kesha looks healthy and glam. When are these guys going to be having their first kid? Not really loving the super long bangs on model Christy Tiegen in Fyodor Golan accessorized with and her doting hubby John Legend in a typical London’esque suit. Wow! American Idol finalist, pop star and actress Jordin Sparks has slimmed down tremendously but we’re not sure this cut of this Michael Costello dress is best for her new figure and the large Goddess like cornrows is a mismatch for the glam sequinned number. Why is this young girl (Modern Family‘s Sarah Hyland) aging herself in this boxy Emilio Pucci suit? 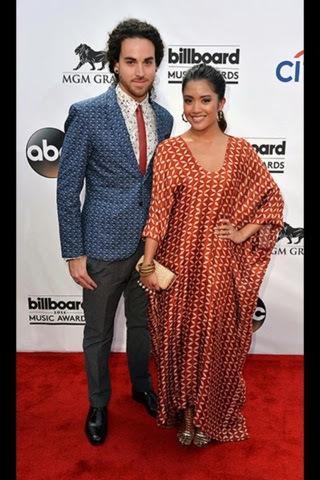 And the group “Us the Duo” get the award for the best etchnic garb and marrying of patterns and shapes. Together, they are a wonderful sight for sore eyes.